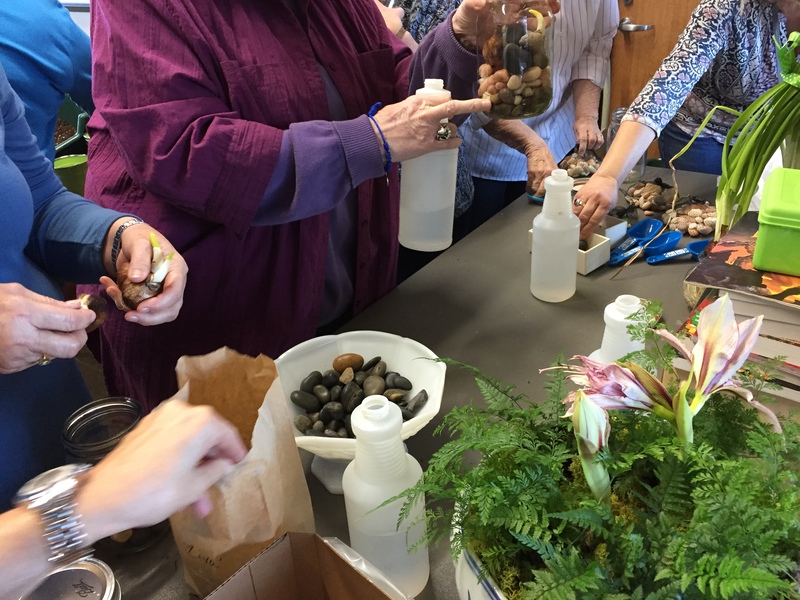 Artificially growing plants to produce flowers outside of their typical bloom season is called “forcing.” Bulbs can be forced indoors include paperwhites, amaryllis, hyacinth, tulip, and Dutch iris, among others. Plant bulbs, like amaryllis, in a well-draining potting soil in pots that have drainage holes. Water newly planted bulbs and keep evenly moist. Place in a bright location and rotate pots every few days to keep plants growing upright. Paperwhites (Narcissus tazetta) are arguably the easiest bulbs for forcing indoors and even planting outdoors in the garden in my area (USDA hardiness zones 8 to 11). They (as well as amaryllis) do not need to be cold treated – do NOT place them in the refrigerator. If planting outdoors, plant in late fall, after Thanksgiving, arranging them about 6” deep in well-draining soil. 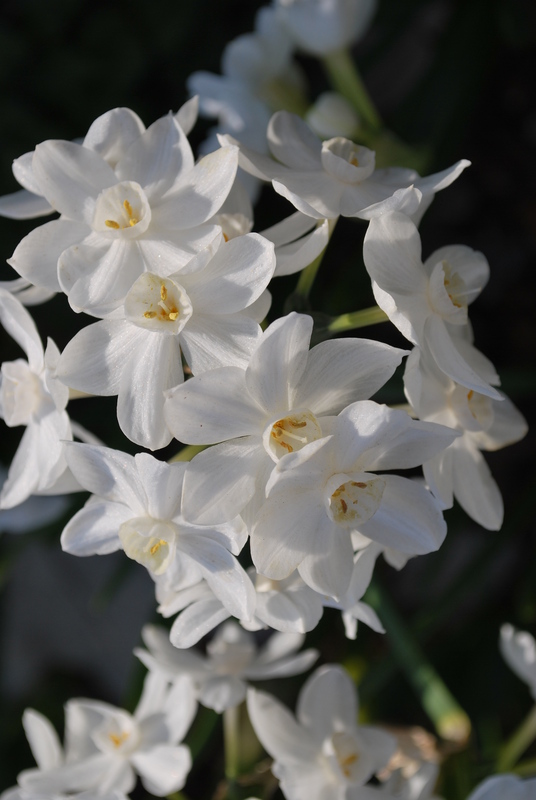 When forced indoors, paperwhites can be grown in soil in pots or water. To grow in soil, fill a pot with a well-draining potting soil, plant bulb(s) just below the soil line (the growth tip can stick out above the soil line), add water, and place in a room with bright light. Multiple bulbs can be tightly packed together when planting. Water every few days to keep soil evenly moist. To grow in water, there are a couple of options for forcing bulbs. (1) The first option is to grow a bulb in a special forcing vase. After placing the bulb in the reservoir on the top of vase, add enough water until it sits at the base of the bulb. If the water is allowed to sit too far up on the bulb, it can cause rot. (2) The second option is to grow bulb(s) in a shallow decorative container, a tall vase, or a wide mouth canning jar. First, add a loose, clean gravel to a container to the desired height. Place the bulb(s) in the gravel so it stays upright – at least 1/3 of the bulb should be above the gravel. Add water to fill up to the base of the bulb(s). 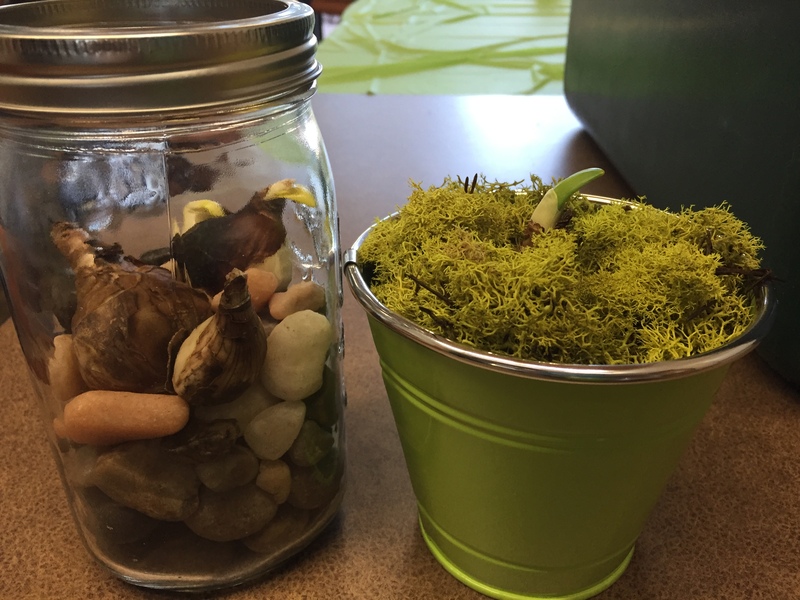 Within days, roots will begin to form, then the leaves, followed by flower buds. Bulbs will generally start flowering within 4-6 weeks after planting. If planted bulbs are kept in a location that is dry and hot, the flowers may not open. It is ideal to keep newly planted bulbs in a cool, dark environment (~55-65 degrees F) while roots begin to form, then move them to a warmer, brighter location after two weeks. Stagger plantings to enjoy blooms all season long. Paperwhites can get tall and leggy in insufficient light. If this happens, stake and tie foliage loosely together with a decorative ribbon to help it stay upright. 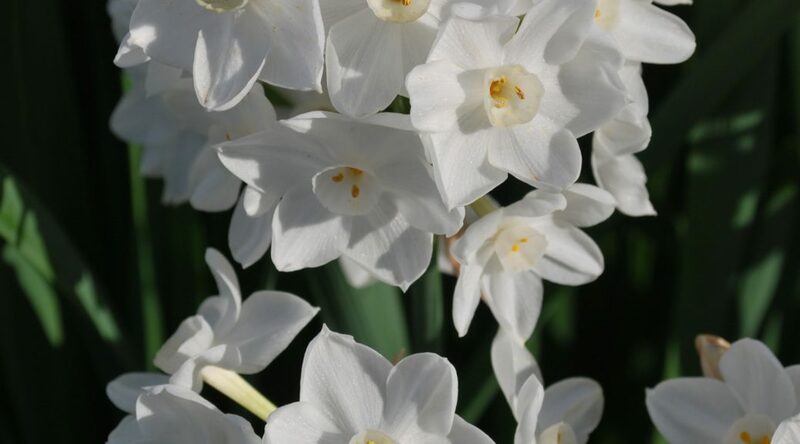 ‘Ziva’ – One of the most fragrant and readily available paperwhites. Clusters of early blooming delicate white flowers. Can be forced in soil or water. Grows 16-18” tall. ‘Wintersun’ – Newer variety that has a light to moderate fragrance. Delicate white flowers with creamy yellow cups. Can be forced in soil or water. Grows to 12-16” tall. ‘Inbal’ – Light fragrance. Does best when forced in soil, not ideal to grow in water. Delicate white flowers. Grows to 16” tall. Note: Narcissus has toxicity. Keep away from children or pets. The fragrance of paperwhites can be unpleasant to some.